Two MSPs both formally quit their Holyrood roles to go to Westminster yesterday. 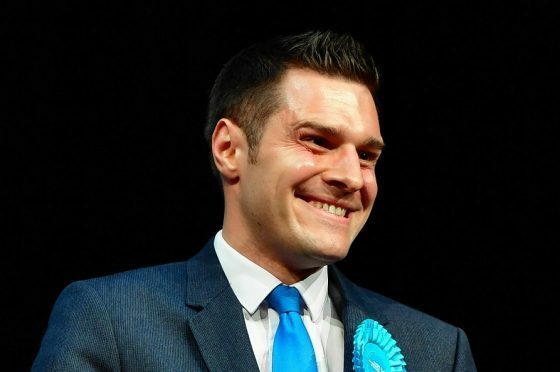 North and north-east representatives Ross Thomson and Douglas Ross were both elected as MPs last week, and said it was their “number one priority” to represent the region’s interests at the Houses of Parliament. Meanwhile, Aberdeen’s depute provost Tom Mason has confirmed he intends to take up his role as a list MSP for the north-east and continue as a councillor. Conservative Mr Mason is to step up to fill the shoes of Mr Thomson, who was elected as the MP for Aberdeen South. Once formalities are completed, Mr Mason is expected to hold a dual mandate, although he will give up his depute provost position. The 74-year-old has been put in a difficult position as quitting the council would destroy the fragile administration majority of one. But, as the last party member on the north-east list, failing to take up the MSP role would leave his party with a vacant seat at Holyrood. He said: “My intention is to take up the MSP role, yes, and I will be continuing on as a councillor too. “It’s three-and-a-half years until the next council elections, so whether it will be appropriate to continue with a dual mandate for the full period remains to be seen. “I will be giving up my role as depute provost but carrying on with both roles. Meanwhile, Douglas Ross is expected to be replaced by Jamie Halcro-Johnston, who is fourth on the Highlands and Islands list, after serving MSPs Edward Mountain and Donald Cameron. Newly-elected MP for Moray Mr Ross had promised to stand down from the Scottish Parliament if elected to Westminster. He said: “It has been an honour to serve in the Scottish Parliament over the past year, where I covered Moray as part of a wider region stretching from Shetland to Argyll. “However, my number one priority is now representing all of Moray’s interests at Westminster. “I said if I was elected that I would make being the MP for Moray my number one priority, which is why I have tendered my resignation to the Scottish Parliament with immediate effect.